www.toginet.com/shows/adoptionjourneytomotherhood November 15th, 2010. Full hour audio/internet interview about Adoption: Uncharted Waters. Shedding Light On The Adoption Experience, VI, September 24th, 2010. Presentation at Conference: Adoption Forensics: Adoptees and the Criminal Justice System: Identity Issues of "Splitting," Self/Parental Image Confusion and Clinical Dissociation in 20 High Profile Cases. Media Tracks "National Health Radio," October 19th, 2006. Interview about ADOPTION: UNCHARTED WATERS and ACS awareness. Sirius Satellite Radio "The Mommy Chronicles", November 10th, 2006. Discussion of adoption issues during "National Adoption Month." Wheeling News-Register, December 7th, 2006. Interview for newspaper article on raising healthy, happy, bonded adopted kids. Merrick Herald, December 14, 2006. Newspaper article Charting Adoption, about Adoption: Uncharted Waters. Love To Know Baby. com, December 18th, 2006. E-mail interview posted on Love to Know Baby.com web-site. Parents Connect.com, an MTV/Nickelodeon venture, December 20th, 2006. E-mail interview re: parenting advice for raising adopted children. MSN.COM, November 30th, 2007. Interview for upcoming show on careers in the fields of criminal psychology and behavioral analysis. .
EKKO Productions, "The Dary Day Show," January 25th, 2007. Interview about Adoption: Uncharted Waters. KCLU "Emotional Fitness Show," January 29th, 2007. 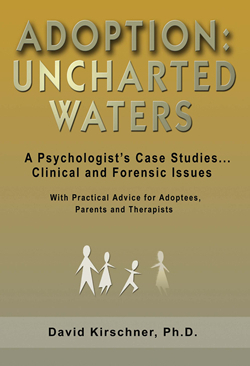 Interview on adoption issues and Adoption: Uncharted Waters.